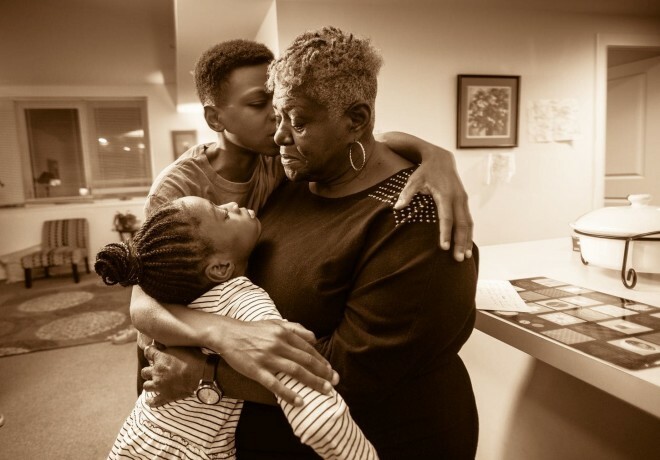 A D.C. housing development serves as a refuge for grandparents raising young children. Is it a model for the rest of the country? It’s a few days after Christmas, and Akirah Carter is sitting in her living room, still wearing her Santa-and-reindeer-patterned pajamas and pointed elf slippers as she tinkers with her gifts: a PlayStation 4, a magic set, Harry Potter books. On the kitchen counter sits a plate of snickerdoodles the 10-year-old baked with her grandmother. She spent Christmas Eve at her great-uncle’s house in Bowie, Md., playing games with her family and singing “Santa Claus Is Coming to Town” on a karaoke machine. That night, after returning home, she left out a few cookies and a glass of milk for Santa. For the past eight years, Carter has served as Akirah’s Santa. Akirah can’t remember a Christmas with her parents. Her mother has drifted in and out of homeless shelters and is now in South Carolina, and her father — who sees her every other weekend — lives miles away and can’t care for her on his own. So Akirah lives full time with her grandmother in Plaza West, a brand-new apartment building in Washington’s Mount Vernon Triangle neighborhood built especially with families like hers in mind.